A few weeks ago they sent out an e-mail at work saying that on October 30th we were going to celebrate the Halloween Holiday by having a costume contest and a “Boo-fet”! I at first thought the e-mail was supposed to be “Boofest” and it was a typo but then I asked and it was supposed to mean ‘buffet’ and that we would have a potluck lunch. They asked everyone to try and be creative and come up with food items that keep with the Halloween theme. I was excited about this because with this politically correct world we live in I thought it was cool that my office was going to celebrate Halloween. All I had to do now was come up with a costume and what food I was going to bring. I started to do sum research and found TONS of cute Halloween food recipes and ideas online and had a hard time narrowing it down. Of course my first inclination was to do a Halloween dessert. Halloween cookies and cupcakes would be fun to make! But by the time I went to sign up there were already 4 desserts. I felt like I had to do something else so I kept looking. 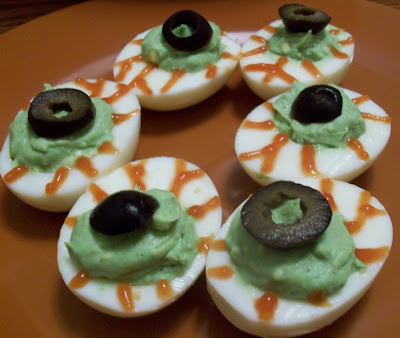 I then settled on these ‘Eye-ball’ deviled eggs. I immediately wanted to do them because they were SOO cute. I thought no one will take this. 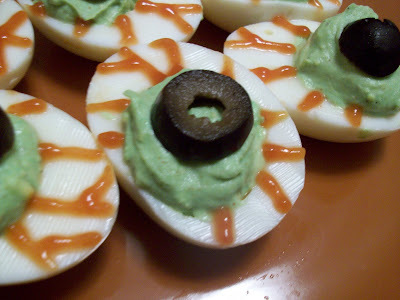 I then went to go sign up to bring them and someone already signed up to bring deviled eggs! Now I have no clue what Halloween food I am going to make or what my costume is going to be and this thing is in days. Anyone have any good suggestions? Please Help! I decided to go ahead and make these egg “Eye-balls” because they were so cute, so easy (and I had several eggs to use up). For the life of me I cannot find the website that I originally saw these on so I am just going to wing it with my own version. In a medium pan, place eggs and cover with about an inch of cold water. Turn heat on medium and when the water comes to a boil, remove from heat and cover for 17 – 20 minutes. Run under cold water to let the eggs cool. Cut eggs in half longways. Remove yolks and put them in a bowl. Add mayonnaise, mustard, paprika, food coloring, salt and pepper. Stir well and pipe them back into egg whites. Put catchup into a Ziploc bag. Cut small hole off end and pipe out lines for eyes. Place one slice of black olive on prepared yolk part of the egg. « Shhh! Don’t Tell Sarah!